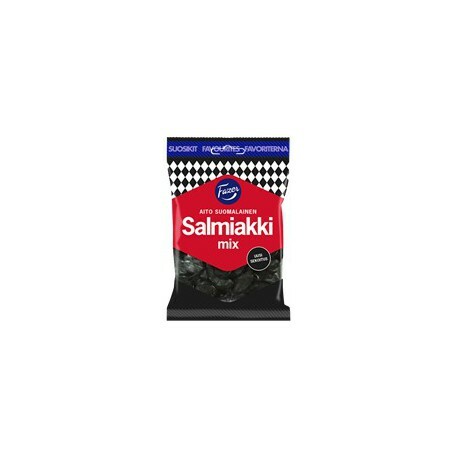 Genuine Finnish salty liquorice at its best. This bag is a combination of all the classics: Strong Vahva Ruutusalmiakki, soft Pehmeä Ruutusalmiakki and Super Salmiakki. (GB) Wine gum with liquorice. Ingredients: sugar, modified starch, glucose syrup, liquorice extract, thickener (E414), ammonium chloride, salt, stabilizer (E420), flavourings, colour (E153), glazing agent (E903). MAY CONTAIN WHEAT. CONTAINS LIQUORICE - PEOPLE SUFFERING FROM HYPERTENSION SHOULD AVOID EXCESSIVE CONSUMPTION. Producer: Fazer Confectionery, Finland.